One great way to simplify your life is to get very clear about your core values… at the end of the day, what matters the most?? 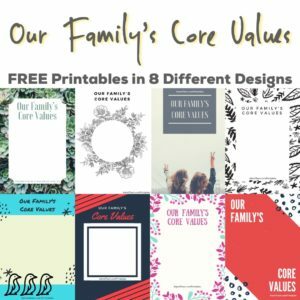 It is a great family bonding exercise to sit down & brainstorm what your family’s core values should be. This is something that the family agrees on & is unique to just your own family. It is something that you can look to when life starts feeling chaotic. Print out your favorite design. Then write down your family’s core values, frame it, & hang it somewhere highly visible in your home as a recurring reminder to simplify & stay true to your core values.